Homeowners looking for eco-friendly flooring options are finding many benefits to choosing flooring made from renewable resources. 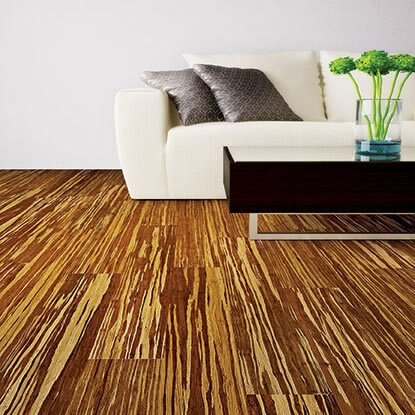 Cork and bamboo are two of today’s most sought after naturally sustainable flooring materials. Both remarkably durable, each of these flooring types offers a truly unique decorating style. No trees are harmed in the manufacturing of cork flooring. Instead, cork is harvested from cork oak trees in a sustainable process that allows tress to continue to grow and reach their full lifespan. Once harvested, tiny cork granules are removed from the bark’s exterior and are processed into extremely resilient planks that offer many advantages for use in the home. Cork is naturally resistant to mold, mildew, and moisture, making it a good choice for rooms where humidity levels and moisture are a top concern, such as bathrooms and kitchens. Cork also does a great job at absorbing room noise, and it provides good thermal insulation, which may help in lowering energy costs. The sponginess of cork also gives it a soft, comfortable feel underfoot. For those looking for a more modern twist on this Earthy aesthetic, products such as Home Legend’s Urban Collection, are available in an array of colors and patterns, including sand looks and basket-weave and herringbone designs. 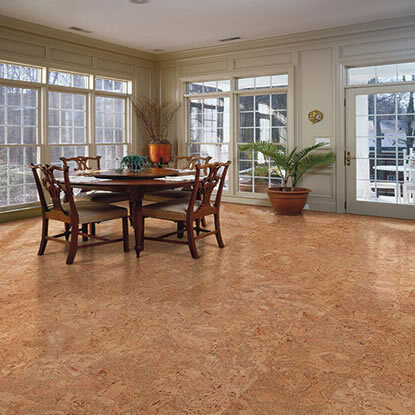 Cork tiles can be floated over existing flooring and installed on, above, or below grade. While cork is naturally water-resistant, a protective polyurethane topcoat is recommended, especially for bathroom installations. Often marketed as a wood product, bamboo is actually a grass that regenerates much faster than wood. While it can take up to 60 years before trees are ready to be milled for wood, bamboo can be harvested in as little as four years and will rergrow to mature height within seven years. Bamboo is also naturally pest-free, so pesticides are not required in its growth. Bamboo looks like wood and can be installed and maintained in the same ways as wood, but what truly sets it apart is its rich tones, natural beauty, and exceptional durability. Products such as strand-woven bamboo are often harder and more resilient than popular oak and maple wood flooring. Bamboo is also resistant to fire and will repel mold, mildew, and moisture, especially when a protective topcoat is applied. Many bamboo manufacturers, such as Home Legend, offer both engineered and solid bamboo collections in a variety of plank sizes, colors, and styles to compliment décors ranging from formal and traditional to informal and ultramodern.